Personal: Resides in Marion, Ind., with wife Michelle and children Cayden, Cameron and Taylor… If he could have another career besides bowling it would be as a PGA Tour golf pro…Favorite TV show is Big Bang Theory and favorite movies is Million Ways to Die in the West…Indianapolis Colts, Pacers and Hoosiers fan…Other favorites include Korean BBQ (food), Justin Moore(musician)...Accomplished guitar player and songwriter...Most memorable bowling moment was bowling first 300 game...Bowled for Vincennes University where he was a first team All-American in 2002 and ‘03. 2019: Finished fourth in PBA Chameleon Championship losing to AJ Chapman 244-233 in second stepladder match. Career: In 2018 was member of Sysco Philadelphia Hitmen team that finished second in Oceanview at Falmouth PBA League Elias Cup Finals. Finished seventh in Tournament of Champions and had ninth-place finishes in Go Bowling! 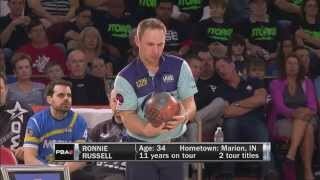 60th Anniversary Classic and Holman-Roth Doubles...In 2017 finished eighth in Barbasol PBA Players Championship and 13th in Oklahoma Open...In 2016 Won fourth career Tour title as member of Merica Rooster Illusion team that won PBA Team Challenge...In 2015, won PBA Badger Open for third career Tour title defeating Dom Barrett in championship match 218-178. Finished second in PBA Players Championship losing in two-frame roll-off to winner Parker Bohn III after tying in championship match 237-237. Teamed with rapper French Montana to win Chris Paul Celebrity Invitational charity event...In 2014 won second career title and first on U.S. soil after 11 seasons on Tour in PBA Bear Open defeating Tommy Jones 234-164 in championship match. Finished second in Chameleon Championship losing to DJ Archer 249-215 in Championship match. Bowled 24th televised PBA 300 game in Tour history in shootout round to advance to championship match. Finished fourth in PBA World Championship and Brunswick Ballmaster and third in Viper Open...In 2012-13 season after 10 years and 142 tournaments, captured his first PBA Tour title by winning Brunswick Euro Challenge. He defeated Sweden's James Gruffman 224-210 in championship match...Owns four Tour runnerup finishes...Earned first Tour exemption as runner-up in 2007 Tour Trials…Won record $15,000 first prize in IGRIND Autism Awareness regional...Owns nine PBA regional titles. 2014 - Bear Open, Shawnee, Okla.
2015 - Badger Open, Shawnee, Okla.
Two-time and current Team USA member...Earned first Team USA berth in 2016...Won doubles and team gold medals in 2016 PABCON Championships.